This experience marks another chapter of my life and the start of my soshal climbing journey. 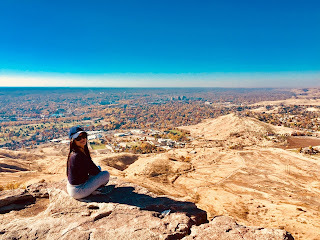 Back in the day the idea of hiking, climbing, or camping never excite me until my BFF and I climbed Table Rock during my last visit in Boise. It's not that I don't like outdoor activities, I just haven't connected with the right people to hike with. So when I saw my BFF's photos on top of Table Rock, I begged her to take me there. She said that this mountain offers a great view of the entire city. I couldn't agree more it's 895 feet above sea level. The trail is 3.7 mile that features dead wild grass and flowers. Summer is over so what do you expect? lol. This trail is a very busy one, aside from hikers you might see bikers too. If you're lucky enough you might spot some hottie trail runners to get you motivated (wink wink). Kidding! Reaching the summit in less than an hour was an achievement for a first time climber. Sitting on the edge of the cliff while admiring the spectacular view is the most rewarding part. Being on top of the mountain brought me piece, joy, and serenity. Breathing the fresh air healed my tired body and even my crazy and wandering mind. Felt like I meditated for more than an hour. FYI: if you're planning to hike this beauty, don't forget to bring water to keep you hydrated. Wear hat to protect your face from the harsh sun. And toilets are available at the parking area.